Kira (Nana Visitor) receives a communication from a Bajoran archivist doing a study on a Cardassian detention center. Records indicate that Kira was held there, but she has no recollection of it. After speaking with a witness who recognizes here from the center, Kira travels to Bajor in search of the truth, but is kidnapped en route. She awakens on the Cardassian homeworld where officials from the Obsidian Order reveal that she is Cardassian and was an under-cover operative sent to infiltrate the Bajoran resistance ten years ago - and now she's home! Back on the station, Sisko (Avery Brooks) and Odo (René Auberjonois) plan to rescue Kira, but a closer ally is also plotting her escape! Quark (Armin Shimerman) gets more than he bargained for when he buys the wreckage of a ship that crashed in the Gamma Quadrant and finds an alien infant hidden inside. When Bashir (Siddig El Fadil) examines the child, he notices an accelerated metabolic rate. Within hours the infant appears to be at least eight years old and exhibits superior language and cognitive reasoning skills. Later, as the boy evolves even more rapidly, he becomes violent and aggressive, and it is discovered that he is an infant Jem'Hadar. 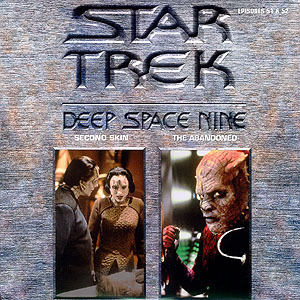 Sisko (Avery Brooks) plans to send the boy (Bumper Robinson) to Starfleet for further study, but Odo (René Auberjonois) objects, and risks everything to save him.